After a stellar regular season that saw the Centre Dufferin District High School Royals junior boys finish in first place with a 6–1 record, the Royals met Orangeville's Westside Secondary School Thunder on the field at CDDHS for the District 4 championship game. 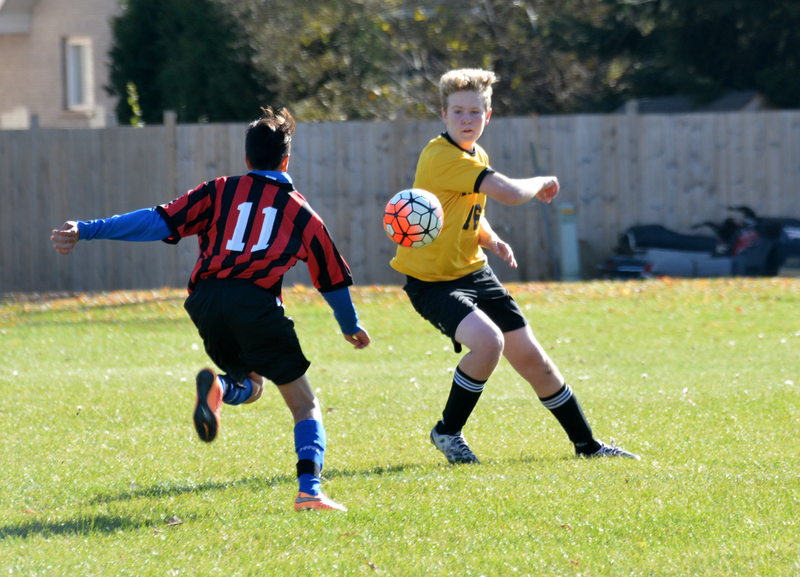 The Thunder arrived with a 6–2 record and a second place finish in the standings so the final game, held on Monday, October 26, on the soccer pitch in Shelburne was set up to be a thrilling match. The Thunder took an early lead scoring their opening goal early in the first half. The Royals responded setting up some good opportunities in front of the Orangeville net but split seconds count in soccer and the opportunities didn't result in a goal. The Thunder took a 2–0 lead early in the second half on a nice set-up with the ball being headed into the net. Midway through the the Royals scored on a free-kick to make it a 2–1 game. Pushing hard through the entire half, the Royals turned their game up a notch in an attempt to tie it up but they just couldn't find the back of the Westside net. The Orangeville scored their third with just under three minutes remaining in the game to end it at 3–1. The Royals won game number eight in their semi-final match against Erin District High School and left the field with a 2–0 game. Royals defenceman Myles Doolittle agreed that the team didn't play to their full potential in the first half. Through the season the Royals beat every other team in the District. Their only loss in regular season play was to Westside. The Orangeville team will now go on to play in CWOSSA. The Centre Dufferin District High School Royals junior soccer team takes on the Westside Secondary School Thunder in the District 4 junior championship game on the CDDHS field on Monday, October 26. The Thunder played a good game after a stellar regular season but lost 3–1 in the final.